When we think of sweet, festive foods, one of the first that comes to mind is plum pudding – picture cannonball-shaped fare amidst either clouds of steam in the kitchen or the purple-blue flames of ignited brandy at the table. 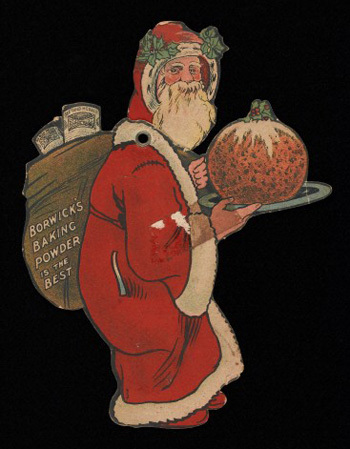 Advert for Borwick’s Baking Powder showing Father Christmas carrying a large Christmas pudding on a tray. c. 1900. Wellcome Images reference: L0040415. Raining on this nostalgic parade comes the sobering realisation of the quantity of organisation and effort required in order to enjoy this traditional pudding on Christmas Day. It can be a daunting task: the preparation of quantities of dried fruit, nuts and candied peel, the laboured stirring, shaping, moulding and wrapping, the protracted boiling, storing and reboiling – just thinking about it is exhausting. Which is why I can thoroughly recommend taking a dive into Wellcome’s household manuscripts in order to discover the delicious and traditional, but above all, easy recipes enjoyed by various 17th and 18th century ladies in times past. Specifically, the plum pudding recipe in the recipe book of Elizabeth Philipps (circa 1694) entitled “An excellent Plum Pudding Hot or Cake Cold”, which is just the kind of two-for-one thinking that can do much to ease the stress on the kitchen during the festive season. 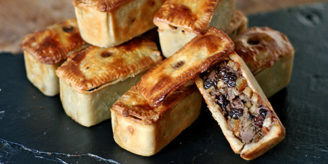 I liked the cut of Mistress Philipps’s jib, even more when, upon reading the recipe, it became clear that this suet-free version could be made and baked in under two hours on Christmas Day. No more panicking as the end of November looms and you realise you’ve missed Stir Up Sunday. Elizabeth Philipps’s recipe for plum pudding in the Johnson Family recipe book, 1694-1831. Wellcome Library reference: MS 3082. It’s essentially a delicately-spiced, yeast-raised dough speckled with dried fruit and candied peel. It is, as Mistress Philipps asserts, delightful either hot or cold, it’s soft, cake-like texture being much lighter and fresher-tasting than the dark version served today. The recipe is marked with the annotation “daughter Green”. This could either mean the recipe was passed to her daughter, , whose married name was Green – although there were unusual naming conventions back then; perhaps Mistress Philipps had a rainbow of daughters? or, more likely, was acquired from her daughter. As if the title wasn’t endorsement enough, a later hand has also awarded a tick and the comment ‘good’. In my opinion, this is the culinary equivalent of a hallmark of quality: something that was so delicious when tasted, the recipe was requested and recorded by hand in the family recipe book, and this approval was then endorsed by a third party coming across the recipe at a later date. 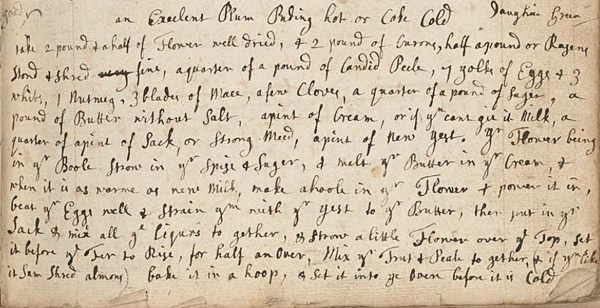 This isn’t the only 17th century plum pudding recipe to be found in the manuscript archives. Lady Ann Fanshawe also recorded a baked plum pudding receipt, and the Temple sisters recorded both their mother’s boiled plum pudding in the first few pages of their book, as well as that of a ‘good baked plum pudding’ later on. 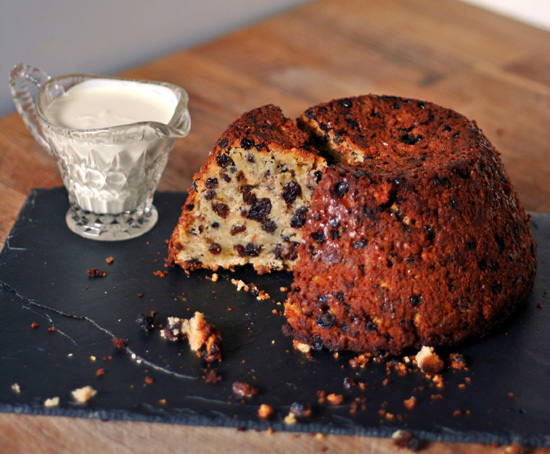 Although the exact dates of these recipes cannot be determined, it is possible to infer from their presence in these manuscripts that plum pudding was alive and well and appearing on British festive tables decades before the first recipes appeared in print in the early 18th century. For anyone wanting to try their hand at Elizabeth Philipps’ plum pudding, I’ve adapted her recipe below. It has become an annual fixture in this house. Plum pudding. Image credit: Mary-Anne Boermans. Bake a single, large pudding for about an hour. Turn the basin round after 30 minutes and check for done-ness at 50 minutes. Bake the small, individual puddings for 15-20 minutes. 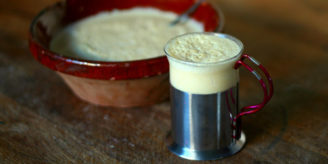 For later: Even though this pudding is nice cold, it really is at its best just warm, so for serving later, heat slices/individual puddings in the microwave for 30 seconds before serving. Enjoyed reading about the recipe written in 1694. Glad to know that certain things don’t change.